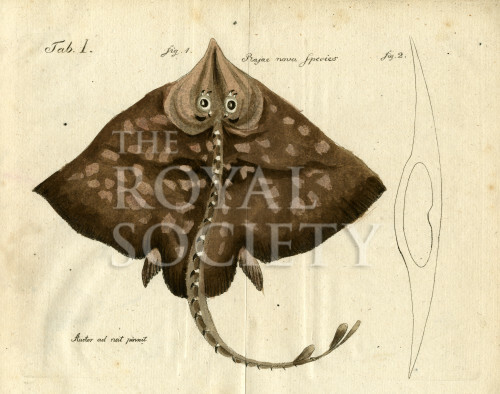 Marine biological studies of a species of skate (family Rajidae) claimed by the author as a new species from the Portuguese sea. The creature is an unidentified cartilaginous fish and is shown from above (figure 1) with a scheme of its front profile (figure 2). Plate 1 from the book Ueber die sogenannten Seemause oder hornartigen fischeyer…by W.G. Tilesius (Leipzig, 1802). Inscribed above: ‘Tab.I. Rajae nova species’. Inscribed below: ‘Auctor ad nat pinxit. Wilhelm Gottlieb Tilesius von Tilenau (1769-1857) German naturalist, draughtsman and engraver.